Spokane mayors usually give their annual State of the City addresses at a high-priced breakfast to people in business suits. On Thursday, Mayor David Condon broke tradition by giving his speech to upperclassmen at North Central High School – and a second time to anyone who wanted to hear it, also at North Central. He’ll still give the speech to Greater Spokane Incorporated, the region’s chamber of commerce, at its monthly breakfast ($55 a plate for nonmembers) today. But he pledged to make the annual speech more open to the public every year. Before his evening speech Thursday, Condon and many other city officials met with Spokane Public Schools science students who presented their work at tables outside the auditorium. “I wanted to highlight the great work that the leadership of Spokane Public Schools is doing because building the city of choice is about building an education system of choice,” Condon said in his speech. focusing on what city administrators are doing to make Spokane a place people choose to live. Condon touted the city’s 2014 budget, which added 25 police officers and was approved unanimously by City Council. He also highlighted the establishment of a criminal justice commission to consider reforms, the creation of a new county-led animal control system, the likely creation of a new county-led trash system, a new plan to stop dumping raw sewage into the Spokane River when it rains, a pilot project working to increase firefighter and medical response times and several other initiatives. Condon only indirectly touched on the ongoing debate about police reform and accountability. The Spokane City Council is scheduled to consider a Spokane Police Guild labor contract on Feb. 10. It’s not clear if the guild will allow within the contract a provision to permit the city’s police ombudsman to investigate alleged officer misconduct independently. City voters have given that authority to the ombudsman, but the guild has not agreed to it. 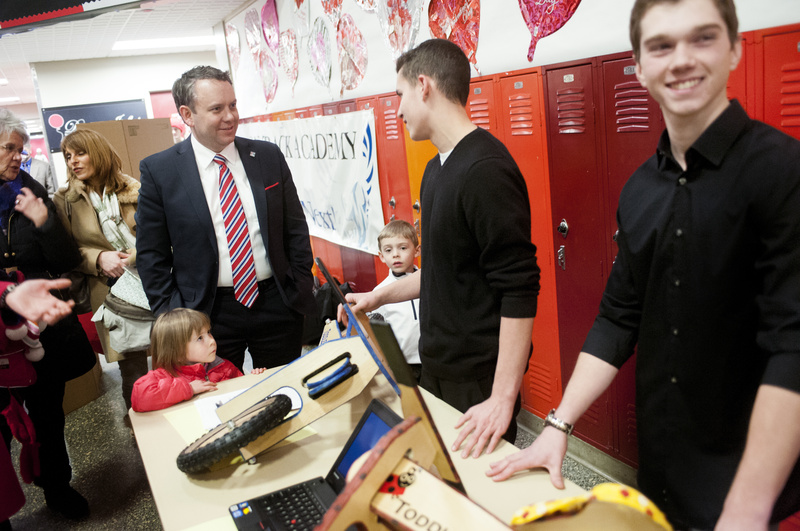 Before his speech, Condon strolled through the science projects, chatting with students about their work. He was nearly run over by a robot designed by Lewis and Clark High School students. He asked his son Creighton, 5, and daughter Hattie, 3, if they wanted to ride a wooden toddler bicycle built by Shadle Park engineering students.